Winnie the Pooh has always had a special place in my heart. So it is perhaps a bit difficult for someone like me to have a truly subjective critical opinion of something that has such innate sentimental value to me. The good news is that Goodbye Christopher Robin manages to avoid overtly saccharine sentimentality, but in favor of something surprisingly dour and downbeat. 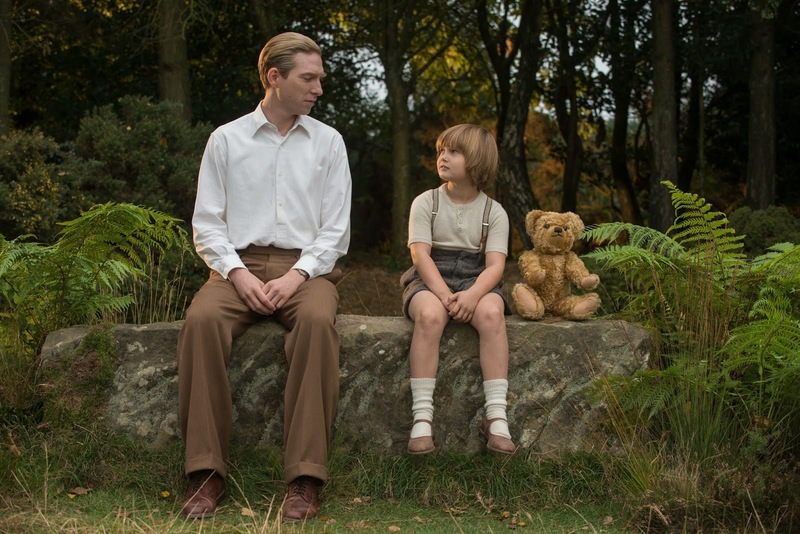 Taking its cues from Marc Forster's Finding Neverland, Goodbye Christopher Robin tells the true story of A.A. Milne (Domhnall Gleeson) and the creation of his most beloved character, Winnie the Pooh. Already a successful playwright, but suffering from undiagnosed PTSD from WWI, Milne and his wife, Daphne (Margot Robbie) mostly leave the raising of their son, Christopher Robin (Will Tilston) to his nanny, Olive (Kelly Macdonald). Shellshocked and distant, Milne decides to write an anti-war book, much to the dismay of Daphne, who craves the fame brought on by his more popular work. So she leaves until he is able to write again, leaving Milne and Christopher alone in their cabin in the woods. Thrown together by circumstance, father and son begin to spend time together in the woods, playing with Christopher's toys - a bear, a baby pig, a tiger, and a donkey. Inspired by their days spent together, Milne begins to write a new book about the adventures of Christopher Robin and his toys, which prove to be a massive success. Suddenly thrust into the national spotlight, Christopher (who prefers to be called Billy) must now share his private life with the world, and soon finds that he is sacrificing his own childhood for his newfound fans. That's where Goodbye Christopher Robin turns surprisingly dark. At its heart, it's the story of a child being exploited for financial gain by his parents. Christopher had no desire to share Winnie with others, and found his fame to be an intrusion on cherished time with his father that he was never able to reclaim. It's a disarming and heartbreaking road for the film to take, especially for anyone for whom Winnie the Pooh and friends has ever meant anything. It's also rich territory for exploring the idea of fame, intellectual property, and especially how it affects children. Unfortunately, the film mostly pays lip service to those ideas then moves on toward a more conventional happy ending. And yet there's something beautifully cathartic about that ending, even after its rather manipulative fake-out. Winnie the Pooh has meant a lot to millions of people around the world, in spite of the rather negative impact it had on the real Christopher Robin. One could probably argue that its ending puts a trite fix on the issues it raises, but director Simon Curtis (My Week With Marilyn) handles it well. 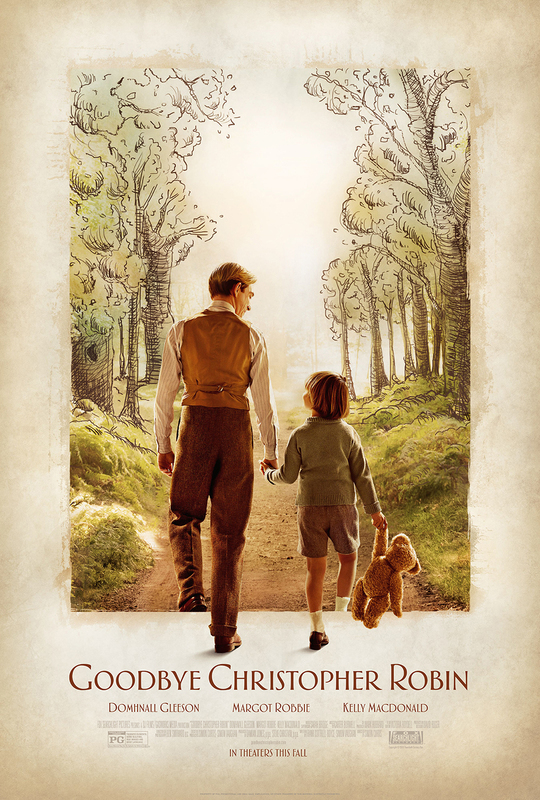 His acknowledgement of the fragility of childhood, coupled with resilience and wonder, make Goodbye Christopher Robin a moving celebration of the essence of what Winnie the Pooh means. It may be a relatively middle-of-the-road weepie, but for anyone who has ever had any affection for that silly old bear, it sure does hit a sweet spot of nostalgia and warmth, and how it is often born from sorrow and pain. With a little more depth, this could have been something great. As it stands, it's a lovely and wistful walk down memory lane that reminds us that the past isn't always sunny as we may want to believe, but never takes that extra step to probe what that really means. GOODBYE CHRISTOPHER ROBIN | Directed by Simon Curtis | Stars Domhnall Gleeson, Margot Robbie, Kelly Macdonald, Will Tilston, Alex Lawther | Rated PG for thematic elements, some bullying, war images and brief language | Now playing in select cities.